Phosphatodraco, the pterosaur from which I made the first picture ever-meanwhile there are two pics of it-this one is the third. 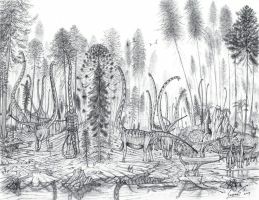 Phosphatodraco was a midsized azdharchid with a wingspan of around 5 metres. The neck of phosphatodraco, the phosphate dragon is the best known fossilised neck of any azdharchid. 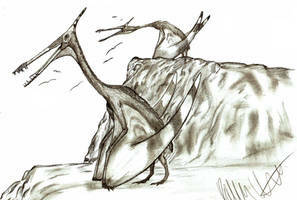 Posture is based on Hyrotrioskjan´s Hatzegopteryx[link] the body and especially the neck are based on the holotype.